It is all about respect. During my recent travels in Thailand with my lovely Zai, we visited the temple complex of Wat Yannasang Wararam Woramahawihan. There are different temples here and one nice stupa. The photo shows the entrance to this stupa. 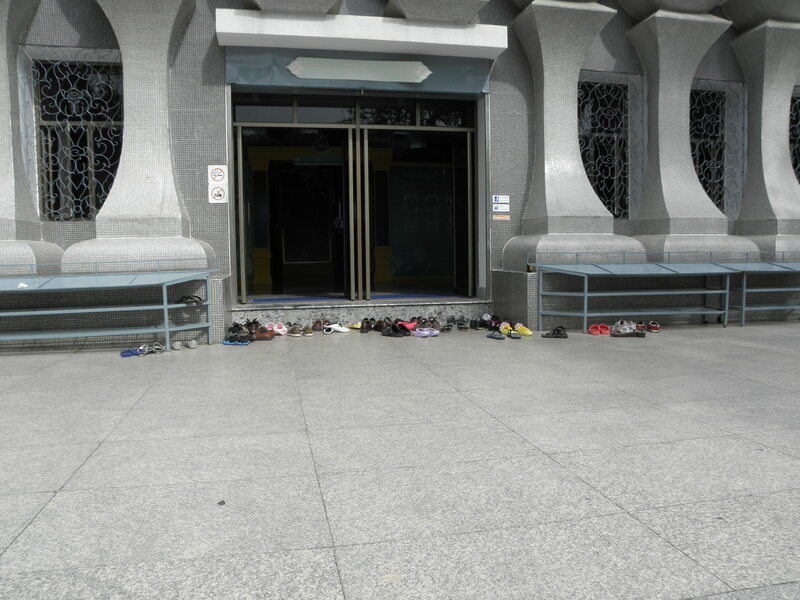 As is usual in Thailand (and many other countries) one takes of one’s shoes before entering. Just before we arrived, a group of Chinese tourists entered and they all (none excepted!) managed to drop their shoes in front of the door, none using the storage space provided left and right of the door! Inside the stupa, their guide provided some commentaries in a rather loud voice. I do not know if it is perhaps a property of the Chinese language but it seems that it always sounds rather loud. Or perhaps the guide just had to shout because the majority of his flock, paid no attention what he was saying and happily carried on their conversations (again in a rather loud voice). Then, when we were making merit in front of the altar on the upper floor, the group of Chinese tourists entered this room as well (and none too discretely) and tried to walk in front of us, in other words, between us and the altar. Now it may very well be that none of these Chinese were Buddhists, but even an atheist (as myself) knows that it is simply not done to cross between someone paying respect at an altar and the altar. I am sure that these Chinese know that very well, but they simply did not care. My lovely Zai made an angry face at these tourists and told them to move behind us. I am not sure whether they understood any Thai, but the meaning of what she said surely came across and they walked behind her. And this is not the only incident we had with groups of Chinese tourists: generally they are loud and show no respect. I really wonder if they act the same in their own country or whether they only do so when abroad.